look out and not in; and lend a hand. Matt Oskar Kangas was born to overcome obstacles. “That’s Life for You,” by Madjag. 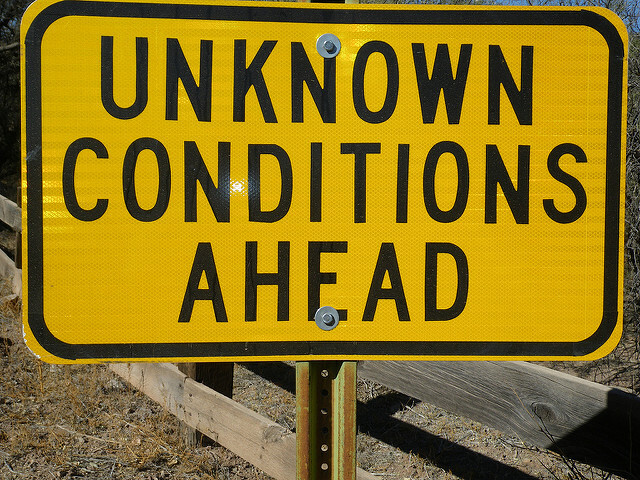 Creative Commons; in the public domain. Matti, as he was known to all, was my father-in-law, Welner Tully’s maternal uncle. In a short memoir he wrote in his later years, Matti recalled growing up in western Finland during an era of poverty, pestilence, and famine. By 1876, when he was born, Finland had recovered from the 1866-68 crop failure and famine that claimed some 270,000 lives, or 15% of the population. However, it seems some areas of the country were still struggling. Matti’s home province of Vaasa was among those wanton areas. Dire conditions forced many men in the area, including Juho Kangas, Matti’s father, to migrate to America in hopes of making enough money to send home to their families. Most of the men eventually returned or sent for their loved ones. Some were never heard from again. With the men of Kauhava gone, the wives, including Matti’s mother, Susanna (Ruuspakka) Kangas, became the new heads of their households. The children of the town did their part to help their mothers, and their days became a mix of school, play, and hard work; Matti, like many boys his age, tried to fill in for his father as best he could. Juho’s absence weighed heavily on him, but watching his mother suffer without him was even harder to bear. He dreamed of helping his father in America. Susanna Kangas did her best to look out for her family, but daily life had become a struggle for survival. Epidemics swept mercilessly through the town. Death became a daily occurrence, and it hit the Kangas family hard. Matti wrote matter-of-factly about watching helplessly as neighbors, relatives, and even his own brothers and sisters succumbed to disease almost as swiftly as it overtook them. Lacking access to proper medical care and education on sanitary measures, some of the women turned to old folk remedies to save their families. One of these unorthodox ideas held that drinking one’s urine would boost the immune system and keep disease at bay. Susanna tried getting her surviving children to do this, desperate to keep them alive, but Matti recoiled in disgust. The first time I read this in his memoir, I, too, felt revulsed. But as I re-read it, I could not help reflecting on how I would feel as a mother if I watched my own children die one by one, with little to no medical treatment available. It would be agonizing. So yes, I can only imagine that the horror, fear, and helplessness Susanna probably felt in that circumstance left her no choice but to try anything that might help, no matter how extreme the measure might have seemed. It was a happy day when Juho Kangas finally returned home, and his stories of life and opportunity in America were all Matti needed to begin planning his own trip to see it for himself. Juho died in 1895, a year before Matti’s chance finally came. Barely a man at 20, he must have had mixed feelings the day he bade goodbye to his widowed mother and his sole surviving sister, Selma, who was by then two years old. It was the last time he saw his mother; Susanna died the following year. It would be 14 years before he would reunite with Selma. Matti loved all things modern. He must have felt exuberant the day he boarded the R.M.S. 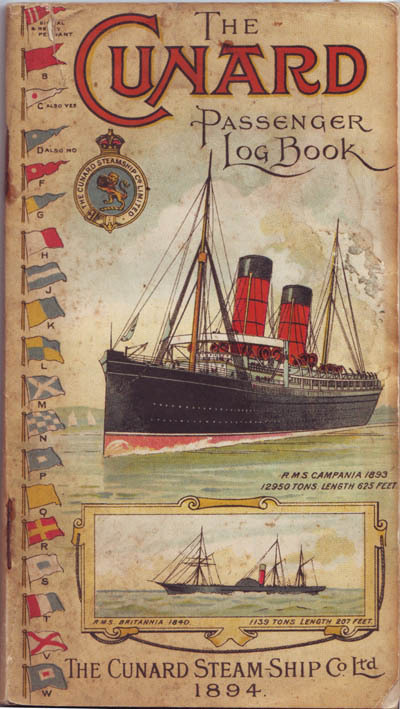 Lucania, a three year old Cunard ship that at the time held the record for being the fastest passenger liner in the world. 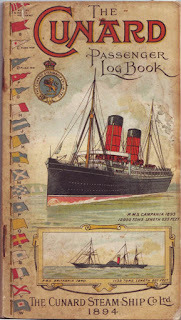 Despite the luxury the Lucania afforded passengers in first and second class, its steerage class was little more than a cattle car for up to 1,000 people, Matti Kangas being one of them. He probably took it in stride, having seen much worse in his young life. He arrived at Ellis Island in New York City on July 25, 1896 and went from there to either Michigan or Minnesota to live with relatives while he got settled. Eight years later, he was working as a coal miner in Diamondville, Wyoming, a wild, hardscrabble community of mostly immigrant Scotsmen, Finns, Slovenians, Italians, and Austrians, among others. Diamondville was a true frontier town. Housing consisted mostly of shacks and dugouts built into the hill near the mine, aptly giving it the name “Shack Town.” With two churches, one school, a jail, a hotel, and a handful of stores, opportunities abounded for new business. Matti was among those who took advantage of this and eventually left the mining life to become a jeweler. He turned 30 in 1906. Still an idealist who wanted to change his world, he entered politics, running for State Treasurer on the Socialist ticket. It was common for Finnish-Americans to belong to the Socialist party with its “old country” origins and friendliness toward them and the language and culture they had left behind. The party advocated for safe labor conditions and fair rights. It also helped various ethnic groups establish meeting and cultural centers where they could gather with others who came from the same places and spoke the same language. For these reasons, Socialist advocacy resonated with the Finnish and other mine workers in places such as Diamondville, where 53 miners were killed in two horrific accidents between 1901 and 1905. It did not fare as well, however, with other Americans, who viewed Socialism as a threat. This was especially true in Wyoming, even then a heavily Republican state. 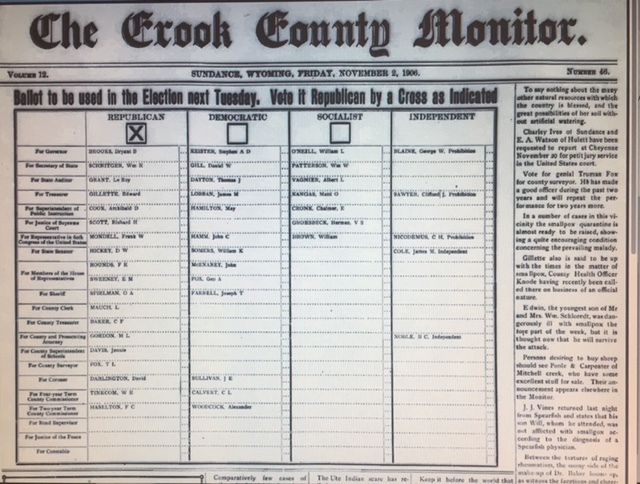 During the election campaign, several newspapers set aside the objectivity that was the hallmark of American journalism, instead instructing readers to vote for the Republican candidate alongside the long slate of candidates for state office from the Republican, Democratic, and Socialist parties. 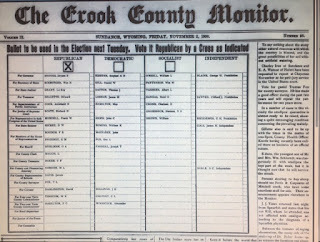 One of these newspapers, the Crook County Monitor of Sundance, Wyoming, printed a sample ballot on the front page of the November 2, 1906, edition, an “X” featured prominently in the box over the Republican slate. On top of the box read the headline, “Ballot to be used in the Election next Tuesday. Vote it Republican by a Cross as Indicated.” Below the graphic, a breezy wrap-up of local and state news wove in at least seven references to the achievements of Republicans and the merits of voting the party. It should be no surprise that Matti lost the election, but he seemed to be no worse for the wear and moved on with his life. In 1908, Matti married a fellow Finnish-American, Anna Liisa Heiska, and nine months later they had a son, Pellervo. Two other children would follow: a son, John, in 1911, and a daughter, Aune, in 1922. He never forgot the sister he had left behind in Finland, and he paid her passage to America so she, too, could start her life anew. 16-year-old Selma Kangas arrived in New York from Yliharma, Finland, on February 26, 1910, and promptly made her way to Wyoming. In the fall of 1914, Matti threw his hat in the political ring again, this time running for the state congressional seat. It is admirable that he chose to do this a second time, given the odds against him. Two years later, an area newspaper, the Kemmerer Republican, reported that he sold his house for $300 and planned to visit the Eastern states before relocating again to either Oregon or Washington State. There is no evidence that the Kangases reolcated to Oregon or Washington. With a sizable Finnish community and several Kangas families living in the Pacific Northwest at the time, it is possible the Kangases went there to visit relatives, or maybe just to see the sights. Either way, when they left, it was without Selma. Records show she found a job as a hotel maid in Portland, Oregon. She would go on marry a young Arizona pressman, Arthur Tully, and have two children, Welner and Vivian. As for Matti and Liisa, they moved their young family east, first to Itasca, Minnesota, and then to Owen, Wisconsin, both sites of large Finnish communities. It was a happy time. Daughter Aune was born in Owen. Pellervo, known as “Pell,” and John were members of the school band, playing the saxophone and trumpet, respectively. During 1927, 18-year-old Pell went on tour in Finland with a Finnish-American band, called the Humina, or “Murmur” band, to Finland. The band played for such notable audiences as the President of Finland and Finnish composer Jean Sibelius and his wife. 1940 found the family once again on the move, this time to Arlington, Virginia, where Matti set up shop as a watch repairman. Pell, John, and Aune grew up, married, and had children of their own. They stayed in touch with their cousins, Vivian and Welner Tully, exchanging letters and Christmas cards over the years. Matti Kangas was 95 years old when he died of a stroke in 1971. Anna Liisa outlived him by eight years. Her death certificate notes that in late January, 1979, she was being helped from her bed in an Arlington nursing home one day when there was an accident and she suffered a broken right femur. Two weeks later, she died of cardiac arrest. 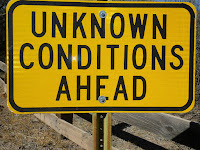 Life is not without its obstacles. Matti had more than his share at an early age, but maybe that prepared him to face the challenges of looking up and making a new life, looking forward and running for public office not once but twice, looking out and raising a family, and lending a hand by bringing his sister to America and helping her adjust. His story is our story, and his dream lives on in the face of every person seeking a better life. I am reprinting a comment from Marian B. Wood, which was lost when the above blog was accidentally deleted. Apologies, Marian! What an incredible life story. I was especially interested in the political angle, including the sample ballot showing what to mark and where! I thought that was interesting, too, Marian. It seemed unusual and differed from an editorial endorsement in that it instructed people to vote the straight ticket, as opposed to the individual. It surprised me to see that this was not the only Wyoming newspaper to do this.